Smith and her team decided their next step was to work with families to develop an exciting Let’s Move! Family Fun Day for children, families and staff so they could experience new activities together. There were physical activities for children and adults of all ages. The day provided a model of how simple items and a few minutes a day can mean the world to each child. The event was so successful there are plans to continue to celebrate this day. The program even made a Let’s Move! Family Fun Day bulletin board that includes staff and family updates with pictures of the children. Penn State University’s Better Kid Care Online Training and the CDC are offering Let’s Move! Child Care (LMCC) training with CEUs. 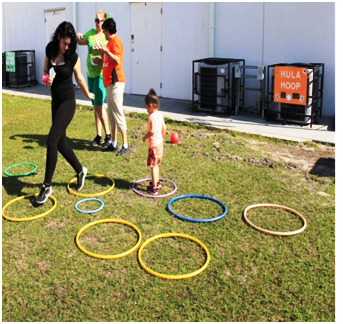 The lesson Childhood Obesity Prevention: LMCC — Increase Physical Activity can help child care providers learn the most up-to-date physical activity recommendations and resources.